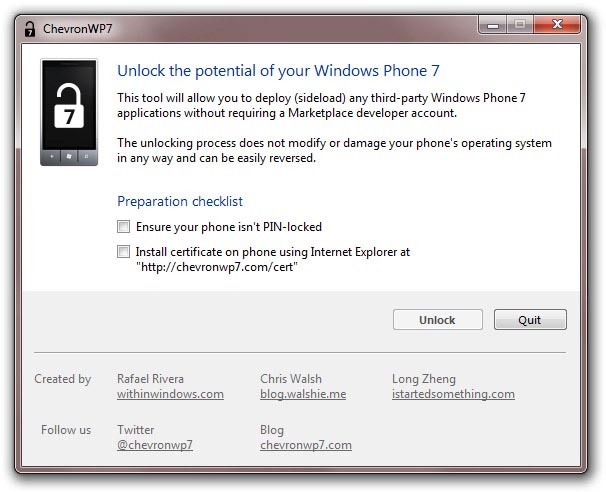 A new tool named ChevronWP7 lets Windows Phone 7 users install applications outside of the Windows Phone Marketplace. Previously, only developers could test their applications on (just their own) phones. Now, any phone “unlocked” by ChevronWP7 will allow home-brew apps – including those denied from the Marketplace because they access private or native parts of the OS – to be installed, which could allow for customization or features beyond what Microsoft currently allows on the platform. ChevronWP7 is available at chevronwp7.com and will run on any Windows Phone 7 device, with Windows XP SP2 and higher on your connected PC.